We made it through another glorious year and there is nothing like good food and drink to help us celebrate. Happy 2013 everyone at JAP! What a great collection! Thank you Ellen. I'm honored. Wishing you and your family a wonderful Thanksgiving. You're welcome, as always, Pat. 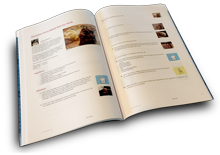 It wouldnt be a cookbook without some of your recipes!